John Deere Skid Steers are one of the most versatile in the industry for many reasons, they have class leading power, operator comfort, price and they have over 100 attachments specifically for their own machines. Without the right tires under your machine, you will never get full capability out of your machine or attachments, and Monster Tires has you covered when it comes to John Deere Skid Steer Tires. We offer the largest selection of tread patterns, plys, and sizes to cover any needs you may have when it comes to John Deere Skid Steer Tires. Your heavy equipment is a big investment, and of course you should be able to depend on it to work hard and get the job done. That can only happen if you have good tires on it. When it comes to your John Deere Skid Steer, the tires you use determine how well the equipment is going to perform. If you are looking for 250 Skid Steer Tires, 320 – 326 Skid Steer Tires, 4475 – 8875 Skid Steer Tires, 575 – 675 Skid Steer Tires, 313 – 318 Skid Steer Tires, or 240 Skid Steer Tires, we have what you are looking for at Monster Tires. First Class Service and Staff Support for all John Deere Skid Steer Tires. We want to make sure you have the answers and support you need to be able to choose the right Skid Steer Tires for your John Deere Skid Steer. We offer a full range of John Deere Skid Steer Tire Size Options. We also offer Front Tire Sets for John Deere Skid Steer, Rear Tire Sets for John Deere Skid Steer, and full Tire Packages for John Deere Skid Steer. 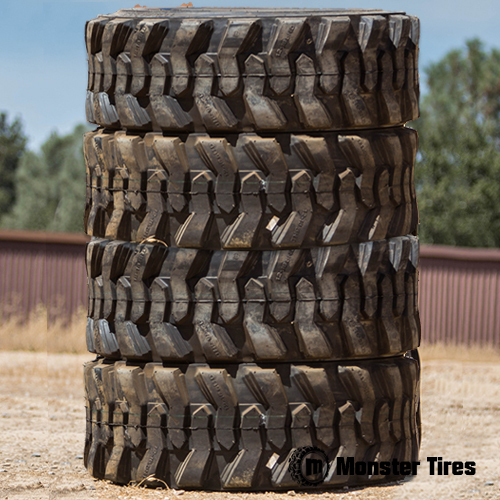 Trust in Monster tires for your next set of John Deere Skid Steer tires!